Virginia Gov. 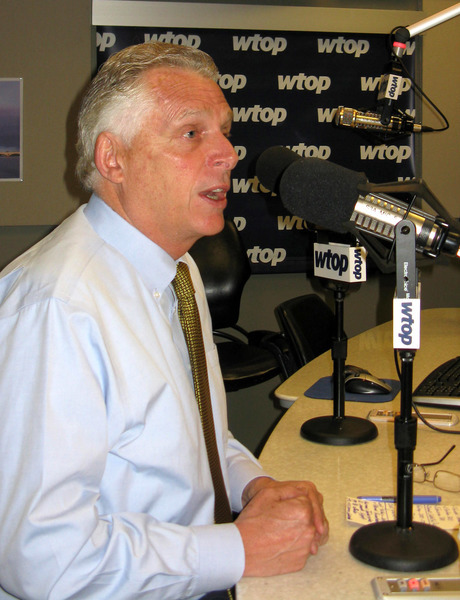 Terry McAuliffe joined WTOP live for "Ask the Governor." Neighbors complained that updated design plans released in March were worse than the initial design and said that the state transportation officials weren't listening to their concerns regarding noise, light and the aesthetics of the design. "We're canceling it because of the public input," McAuliffe said. The decision was made last week during a meeting at the governor's office, he said. Another solution will have to be found to accommodate, or possibly move, a Metro power substation to make room for the extra lanes, he said. The revised plans called for building a tall flyover ramp that would cross above the substation, a pedestrian bridge and Gallows Road. A technical review of the design was delayed in order to give local officials more time to scrutinize the plans. McAuliffe gave an impassioned defense of his 40-year friendship with Bill and Hillary Clinton in response to a question about how that relationship could affect his wife, Dorothy McAuliffe, should she run for Congress. "I do not, ever, walk away from my friends," he said. "I'm proud of my relationship with the Clintons," he said, describing the couple as "our best friends." The ultimate political animal, the former DNC chair also plugged the success of those friends, calling Bill Clinton was a "spectacular" president and noting his high approval ratings when he left the Oval Office. He called Hillary Clinton, whose 2008 presidential campaign McAuliffe ran, a great senator and secretary of state. He shared that his children have traveled the world with the Clintons over the years. "We love the Clintons," McAuliffe said after the show. "But this is a race about the 10th congressional district. It has nothing to do with Bill and Hillary Clinton." McAuliffe said he would support Tom Perriello if the former congressman should win the June Democratic primary. But in the meantime, he is backing Ralph Northam, the lieutenant governor and former state senator who has the support of most of the state's elected Democrats. Perriello, of Charlottesvile, has received support from Vermont Sen. Bernie Sanders and Massachusetts Sen. Elizabeth Warren has campaigned on a more progressive platform than Northam, of Norfolk. McAuliffe said that's not a sign of a party fracturing, but of primary politics. "The most important thing for me is to make sure that a Democrat is in (the) office," said McAuliffe, who is barred by term limits from seeking a second term as governor. Three Republicans are vying for their party's nomination in the race for governor. Virginia's off-cycle elections are seen as bellwethers of the electorate and the race for governor is no exception as it comes during President Donald Trump's first year in office. McAuliffe said he's never seen such passion in the state's voters, who are experiencing "a hangover against President Trump." That's increased turnout at committee meetings and helped recruit candidates to run office. "They are tired of the tweets. They want results and he has given us nothing," McAuliffe said. McAuliffe: You run if you think you can make a change, make a difference. You don't run because you think you'd win. I have encouraged her to run. I think she'd be great. McAuliffe: She's raised five children (2 still at home), been by my side for 20 years. She knows the issues inside and out. She's a lawyer. But she's got to decide ultimately. Will your connection to Bill and Hillary Clinton hurt Dorothy McAuliffe should she run? McAuliffe: Bill and Hillary Clinton are our best friends. We've been friends for 40 years. He was a great president. I never walk away from my friends. Take it or leave it. Clinton has said that even in his darkest days there was one person who was with him: Terry McAuliffe. McAuliffe: The Clinton family has been great to our family. Will stand by them. The race should be about ideas, same with the current Virginia governors race. I"m proud of my friends. Predatory towing bill: He signed the legislation yesterday, had conversations with chambers of commerce and small businesses, signed it based on those discussions. Alexandria combined sewer separation: He signed the bill to prevent millions of gallons of raw sewage from being dumped into "our beautiful Potomac." He wanted to amend it to give the city two more years to complete the project, but it was rejected. He didn't want to veto it, Alexandria can go back to future General Assemblies to try and seek an extension, but they need to start the project. On to the governors race. He supports Lt. Gov. Ralph Northam, has been a leader in the Senate especially on issues related to womens health choices. But he welcomes Tom Perriello's entry to the race. Let the best candidate win. If Perriello wins, he'd support him. Says the most important thing is that a Democrat wins in November. McAuliffe: Seeing increased passion from voters - they have a hangover from the Trump presidency. That's it for this month. We'll post the full audio and a story shortly. Thanks everyone for joining us. Has any consideration been given to a build a complete bypass of Washington DC and northern Virginia in an effort to reduce traffic congestion? Governor: The Redskins are making their push to build a new stadium: Do you support VA Taxpayer dollars or publicly backed bonds or tax breaks for the NFL team to come to VA? Governor, given how many cities and municipalities have taken large financial losses over the bonds that built NFL stadiums at whole or partial expense to taxpayers. Given the current needs, why would you support the Washington football team's request for a bond, if it came to it? Hello, Governor, I have a question for you pertaining to Veterans Affairs. My father was recently admitted to our local hospital on April 14 for a life-saving procedure that wound up happening yesterday because they could not proceed with the procedure due to the infection that he had. The VA is saying they are nothing going to cover the cost even though it has been approved in their computer system because we did not have the paperwork to give to the hospital. Now, why should my father have to stress the cost of this surgery because someone in the VA is too lazy to print a paper and send it to the hospital? Why should he have to go through this stress, to begin with when he is already a member of the Choice Program? I am at least a voice for my father what about those Vets that do not have a voice for them? What do you plan on doing to improve the VA system?